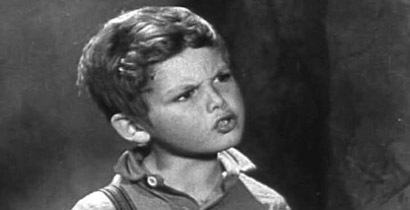 Child star and toddler Dicke Moore is the only naturalistic actor in the first talking Oliver Twist. The first talking Oliver Twist (1933) features the most evil take on Fagin. Irving Pichel, who made his career playing ethnic villains, is all gleaming eyes, stooping shoulders and whining voice, practically cackling over rubbed hands. The other characters are similarly stagy, overacted with their faces as though the actors thought they were still playing in the silent flicks. The only natural one is child star Dickie Moore. Though, like Coogan in 1922, he's just seven years old, this is his thirty-eighth film. He's still not much of an actor though, just a kid seeming to have fun following directions. At one time when Oliver's running away, he's encouraged to perform somersaults (as Coogan had) for passing carriage riders, and he does so charmingly. Like Coogan again, Moore is too small, practically a toddler, to be Dickens's Oliver, while the gang of pickpockets he falls in with, including Charlie Bates and the Artful Dodger (another iconic Dickens figure), are way too old—in their twenties or thirties, I'd guess. My sense of the book is that the young miscreants should be only a few years older than Oliver, maybe 13 or 14 to his 10 or 11. Not that a film adaptation has to be a slave to the book. But the wide age difference in this film makes the gang's efforts to recruit Oliver seem less like criminal mentoring than child abuse. To fit the story into 80 minutes, the plot is telescoped more than in later adaptations. We practically go right from the orphanage dinner scene to Oliver lighting out for London, with no stopover as an undertaker's apprentice. Later, when he's led to breaking into a house with the London gang, it turns out to be the same house that he had previously been taken in by and thus he's immediately recovered by his friends and saviours without the complicated intrigues of the novel. Also missing are three-quarters of the subsidiary characters created by Dickens, including the seemingly pivotal Mr. Monks. Surprisingly though, this is one of the rare adaptations that includes Fagin's final scene when Oliver visits him in prison before his execution and an insane Fagin deludes himself into thinking the boy is sneaking him out. Despite its problems, this Oliver Twist has to be credited as a good early attempt, especially by Hollywood standards. The spirit of Dickens is retained and the viewer who can make allowances for early filmmaking is assured of a relatively entertaining hour or so. See it first, if you can, so you'll appreciate the greater Oliver Twists to come.